Iraq war veteran gets violent in Portland: Hate crime or PTSD? He caused an incident in a Portland, Ore., restaurant that resulted in felony hate-crime charges. But friends and family of the U.S. Marine say it was caused by post-traumatic stress disorder for which, despite repeated efforts, he never received effective treatment. PORTLAND, Ore. — The DarSalam Iraqi restaurant, with its steaming plates of falafel and kebab, has for years served as a popular community gathering spot here. The Iraqi family who ran it felt welcome in this eclectic city. But all of that changed one night last spring when a man with a shaved head walked in and took a seat. As other customers chatted, he refused to order, instead staring at photos of the Iraqi countryside on the wall. After about a half-hour, he got up, walked over to the cash register, began cursing about Iraq, and threw a chair at a waiter’s head, sending him dazed to the floor. Portland has been on edge over a sharp increase in hate crimes this year. Swastikas showed up on school walls; a mosque received a threatening letter that read “I will enjoy the sight of the blood of you and your fellow vermin running into the streets.” Two men were killed in an attack by an avowed white supremacist on a commuter train. Determined to take a stand, the authorities came down hard on the restaurant attacker, a 40-year-old California man named Damien Rodriguez. 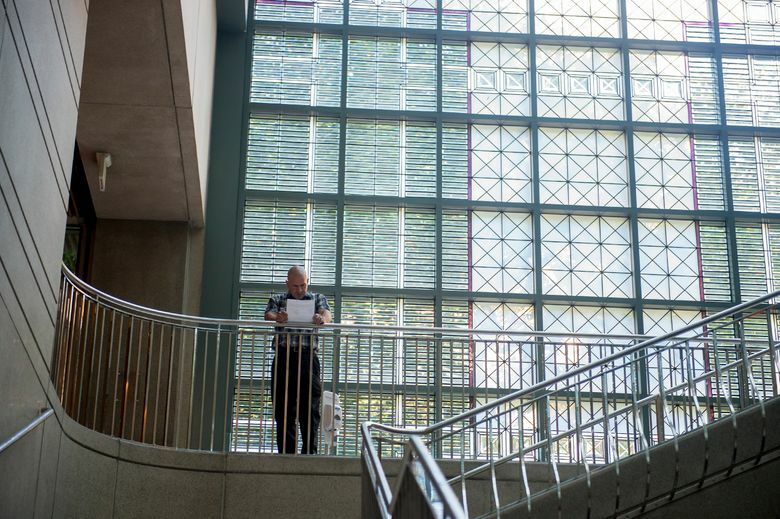 Though similar crimes typically merit misdemeanor charges, lawyers said, prosecutors charged him with felony-level hate crime and assault charges that carry a mandatory prison sentence. That is where people who know Rodriguez say the case took a wrong turn. Rodriguez was a decorated Marine sergeant major who was forced to retire after his arrest. He had spent years in combat. Friends and family say his actions were not provoked by hate but by post-traumatic stress disorder for which, despite repeated efforts, he never received effective treatment. 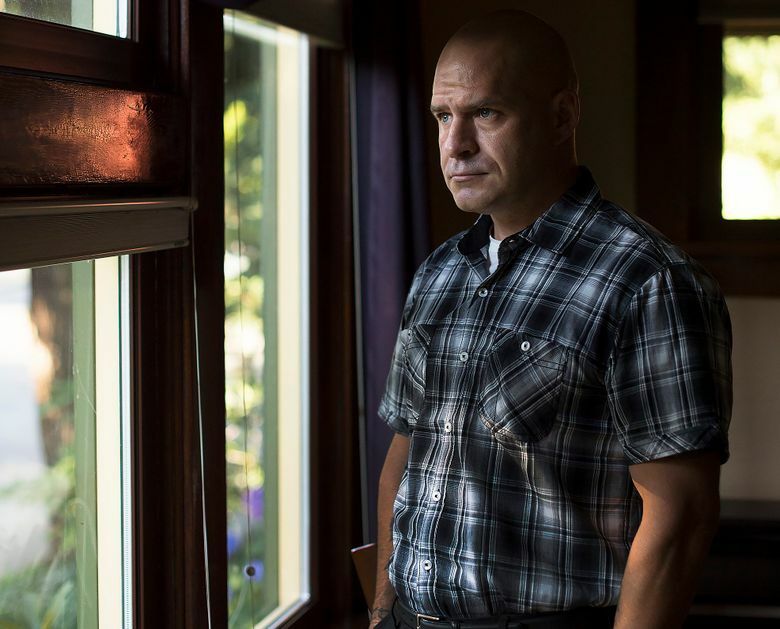 As the case unfolded over the summer, it raised questions about what constitutes a hate crime and how effectively the legal system treats combat veterans who suffer from PTSD. Hundreds of cities across the country have set up special veterans courts devised to offer therapy instead of jail time to wounded veterans, recognizing that treating trauma can be the best way to avoid more crime. But there is a catch: Most courts bar veterans who have committed a violent crime. That is the case in Portland. Because Rodriguez was charged with felony assault, he cannot appear in the veterans court that might offer supervised treatment. Instead, he faces years in prison. The Iraqi man who owns the restaurant, Ghaith Sahib, said that when his employee was attacked it left him and his staff deeply shaken. A decade ago, Sahib was nearly killed by a car bomb in Baghdad and became a refugee, fleeing to five countries before landing in Portland. The restaurant attack left him worried that he would never really escape the war’s aftermath. Both Rodriguez and Sahib are trying to move on from lives upended by war, and both want justice. But they have different ideas of what that means. Rodriguez, who is white, was raised by a Nigerian stepfather, married a Guatemalan woman, and for years relied on an Iraqi next-door neighbor to help his family when he was fighting overseas. He does not consider himself prejudiced. “How can they say I hate Iraqis? I gave my soul for Iraq,” he said. Friends and family say four deployments to war zones left him changed, especially the first one. In 2004 he went to Ramadi, Iraq, as a 27-year-old platoon sergeant. The tour with the 2nd Battalion, 4th Marine Regiment is widely thought to be one of the deadliest six months of any U.S. unit in either Iraq or Afghanistan. Thirty-four Marines were killed and more than 255 were wounded. 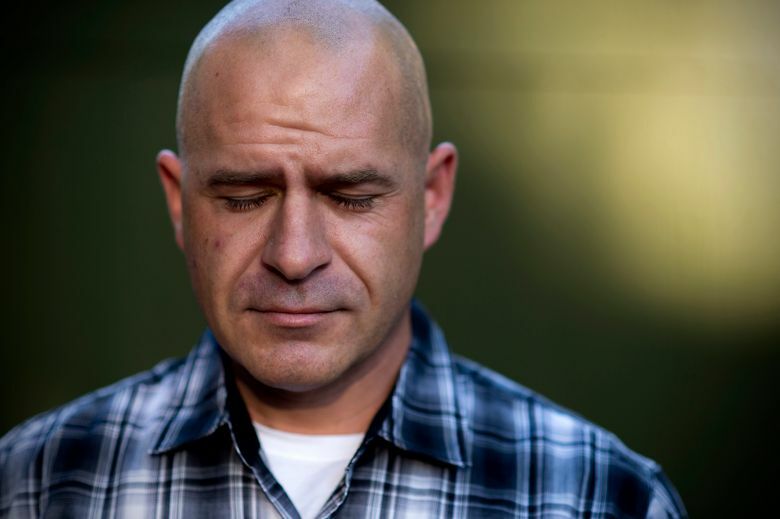 Several moments from those months still commandeer Rodriguez’s thoughts, but none more so than the morning of April 6, 2004, when he was leading a dozen Marines down an urban boulevard and rooftops erupted with the flash of gunfire. Hundreds of enemy fighters had launched a coordinated ambush all over the city. By sundown, 12 Marines in the battalion were dead. In an interview, Rodriguez tried to describe the fight, but stammered and fell silent several times before beginning to cry. According to other Marines from the squad, the ambush split their group in two, and Rodriguez ordered his half into a house to assess a grim situation. A pair of Marines lay dead in the street. Two more a block away had been hit by a grenade. Reinforcements were bogged down. Enemy fighters were trying to scale the walls into the courtyard of the house. Ammunition was running low. Pieces of the battle are clear to him more than a decade later: the frantic crackle of the platoon radio, the feeble thumbs-up from a 21-year-old private who had been shot in the neck. The anger he felt after recovering the fly-covered body of a 19-year-old Marine after the battle — a kid who had written a letter to his church saying faith in God would keep him safe. Other parts are a blur. The citation for a Bronze Star that Rodriguez received for valor says he killed 10 enemy fighters that day. He doesn’t remember clearly. When he returned home, friends said, Rodriguez seemed drained. He spoke little about what had happened, but couldn’t sleep, and drank heavily. He began having visions at night of dead Marines. On anniversaries he visited their graves and weathered the blame from their families. He put in paperwork to award the men Bronze Stars, and hung the citations on his wall. Many in the battalion were also haunted by the experience, but it was early in the war, and formal PTSD diagnoses were rare, said Winston Jaugan, who was Rodriguez’s friend and, as a gunnery sergeant, his boss. “No one had a diagnosis. They would just give us pills for everything — Valium, Ambien. And we would drink,” he said. As a leader, other Marines said, Rodriguez carried a particularly heavy burden. Rodriguez was deployed to Iraq again in 2006, and to Afghanistan in 2010 and 2012. In between, he repeatedly went to the Marine Corps for help, according to records. Over the years, doctors gave him five different medications to treat anxiety, depression and panic attacks. The Marine Corps eventually diagnosed him with PTSD, but never gave him the type of evidence-based psychotherapy that is widely seen as the best treatment. Dr. William Nash, head of psychological health for the Marine Corps, said that during the first years of the war, the military did not have enough psychologists to meet the need, and quick, 10-minute consultations, just long enough to prescribe medication, became the default treatment. Since then the Marine Corps has ramped up treatment significantly, he said. However, he added, getting senior enlisted leaders like Rodriguez to come in for help is a hard sell, because they often see a PTSD diagnosis not just as a risk to promotion, but as an affront to their self-image as tough and self-reliant. A number of career enlisted Marines said troops who have served since 2001 are often suffering, but play down the effects. The suppressed symptoms push some Marines quietly to the brink, he said, sparking outbursts like the one in the restaurant. There is no evidence that combat veterans are more prone to committing hate crimes, but studies suggest combat veterans with PTSD commit violent acts at a much higher rate than civilians. The prosecutors handling the Portland case said a prison sentence could still be avoided with a pretrial agreement. But Rodriguez’s lawyer said prosecutors have told him privately that they feel the Marine should do time behind bars. He is scheduled for trial in December. Over the years, Rodriguez said he learned to control his PTSD. There were only two situations in which he still struggled with what his family called “the dark side,” he said. The first was when he would drink. The second was April, when the anniversary of the fire fight felt especially raw. On one of those nights he happened upon the DarSalam Iraqi restaurant. He had just taken over command of a recruiting station and was hungry after having drinks at a nearby bar to celebrate with a retired Marine. Like Rodriguez, Sahib was still pursued by memories of war. When the United States invaded Iraq, he had been a college student, watching what he had hoped would be liberation devolve into looting and killing. Blasts shattered windows. Neighbors showed up dead in the street. One night, a sign appeared on his family’s door that said they were next. In 2005, a car bomb put him in a coma. After he recovered, he fled to Syria, India, France and Germany before finally meeting his future wife, an American, in the Netherlands, and moving to Portland. 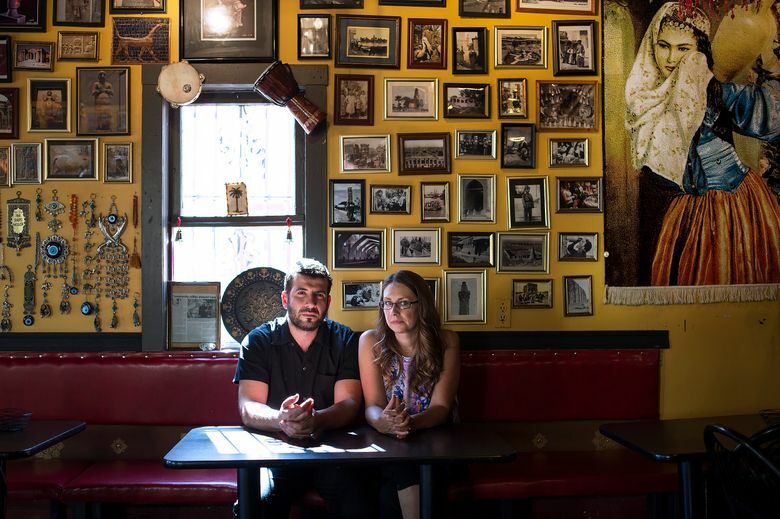 The couple opened their restaurant as a way to present a kinder side of Iraq to America. Before long, to their surprise, it became a hangout for Iraq veterans, who held a poetry reading at the restaurant and became friends of the family. So he was stunned when he got the call about the attack. Surveillance video shows Rodriguez and the retired Marine take a corner table where his back could be against the wall — typical behavior of veterans with PTSD. After several minutes of not ordering, he said loudly that he had to get out of the restaurant, witnesses told the police. He tried to go through a side door but found it locked, so he stood, wringing his hands. He cursed about Iraq. Then suddenly, he picked up a chair and hurled it at a waiter. Rodriguez has offered to apologize, but so far the family has been hesitant. “He has caused such harm,” said Tiffany Sahib, Ghaith Sahib’s wife. Rodriguez acknowledged in an interview that he has never been able to completely control the effects of his combat experiences, but said he did not know what caused him to hit the waiter. It is a blank. “All I can remember, honestly, is being handcuffed by the police,” he said. After his arrest, the Marine Corps forced him to retire. Freed from the pressures of his career, he entered an intensive program for substance abuse and PTSD. In the months since, he has tried to make peace with the fact that his dedication to his career was also its undoing. But Rodriguez says he is disheartened that the final assessment of years of service could be conviction for a hate crime.